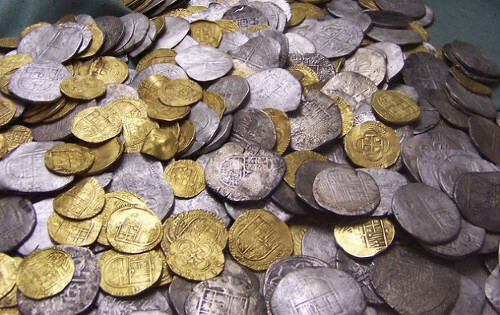 As recently reported, a group of Costa Rican park rangers patrolling in the Parque Nacional Isla del Coco after a recent storm, have discovered one of the most amazing treasure hoards in modern history. The treasure consists of gold and silver coins and ingots, jewellery, candlesticks and religious items, and is estimated to be worth almost 200,000,000$. This is what reports the online magazine "worldnewsdailyreport". "Cocos island is a small island designated as a National Park, located in the Pacific Ocean, approximately 550 km (342 mi) from the Pacific shore of Costa Rica. It was well-known for possibly holding various legendary treasures, but its “protected area” status had forbidden treasure hunting on it since 1978. A group of six rangers who were walking around the island to evaluate the damage done by a storm on the nesting colonies of migratory seabirds, when they noticed that the tide had unearthed what looked like an old wooden box or chest. The began unearthing it, only to discover that there were actually five different chests and other items, that they had been buried there for a very long time. 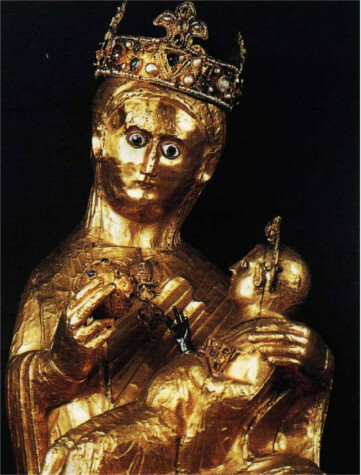 This amazing statue of the Virgin Mary holding baby Jesus, weights an incredible 84.7 kilograms of solid gold, meaning it’s shear metal value is more than 1,450,000$. All in all, the treasure contains an astronomical 89,000 coins, ingots and artefacts of gold and silver.. Many religious items made of gold or silver and adorned with precious stones were among the findings, including 36 crosses, 3 chalices and two life-size solid gold statues of Mary holding the baby Jesus. Many treasure legends have been associated with Cocos island for centuries. The first claim is associated with the pirate captain Bennett Graham who allegedly buried 350 tons of gold raided from Spanish galleons on the island in the 18th century. Another pirate captain, the Portugese Benito Bonito, is also supposed to have buried treasure on the island, this time in the 19th century. Archaeologists and historians believe, however, that the discovery is actually linked to the best known of the treasure legends tied to the island: that of the treasure of Lima. According to the legend, with the army of José de San Martín approaching Lima in 1820, Viceroy José de la Serna is supposed to have entrusted the treasure of the city to the British trader, Captain William Thompson, for safekeeping until the Spaniards could secure the country. Instead of waiting in the harbor as they were instructed,Thompson and his crew killed the Viceroy’s men and sailed to Cocos island, where they buried the treasure. A total of 80,000 silver pieces of 2, 4 or 8 reales and 2,800 gold pieces of 2 and 8 escudos were found by the park rangers. Hundreds of attempts to find treasure on the island have failed. Prussian adventurer August Gissler lived on the island for most of the period from 1889 until 1908, hunting the treasures with the small success of finding six gold coins. Since it was discovered in a National park, the totality of the treasure is now the property of the Costa Rican government, and it should be exposed at the Museo Nacional de Costa Rica, in San José. The rangers who discovered the treasure have been promised a reward for their role in the finding, but the amount of the reward remains undisclosed."